President of Ukraine Petro Poroshenko has noted the success of the decentralization reform in the country. "I won't give up and betray decentralization, because this is a successful reform. When we were preparing it, we used the experience of the whole of Europe, from Poland ... to Germany," Poroshenko said at a meeting of the Regional Development Council of Poltava region. 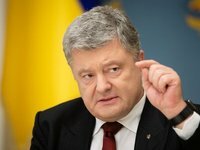 Speaking about the advantages of decentralization, Poroshenko noted that in 2013 the volume of state assistance to local self-governance authorities was UAH 500 million, and in 2019 some UAH 33.5 billion. "[A growth] of 67 times! Here you have the authority, here you have the participation of the state!" Poroshenko stressed.